A tablet that folds in half to become a phone... sound familiar? Motorola seems to be going big on folding phones at the moment. Yesterday, we reported on patent drawings that show the upcoming Motorola Razr 2019, with its folding screen on the inside of the handset, and today we can reveal a second folding phone format that Motorola also appears to be working on. This second format is more like a folding tablet, with the screen on the outside, which positions the new device as a direct competitor to Samsung's upcoming folding phone, the Samsung Galaxy X (or Galaxy Fold, as it may eventually be called). 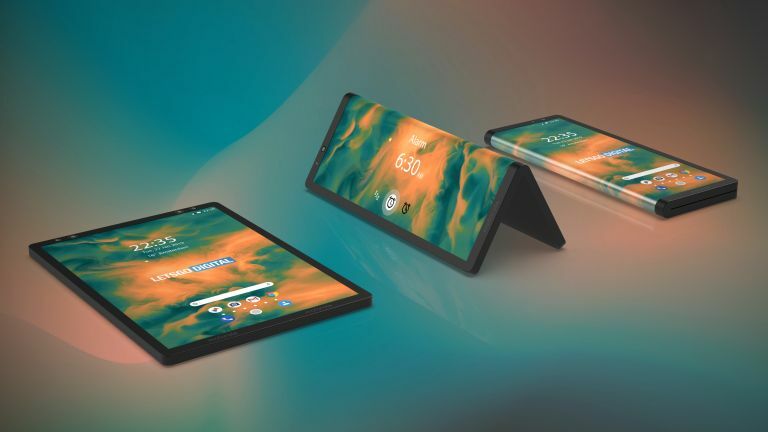 The patents for this new folding Motorola were discovered by Dutch site LetsGoDigital which then produced the 3D renders shown here, based on the drawings. Both this Motorola device and the Samsung Galaxy X feature a large screen which folds in half, but the difference is that the folding screen on the Samsung is on the inside (and there's a smaller second screen on the outside), while the Motorola patents diagrams show the Moto folding screen on the outside. Motorola's solution negates the need for a second screen as the main screen is always viewable, which could help to keep the handset's costs down when compared to the Galaxy X. The drawings also show how this format enables the phone to be used as a display in its folded state – as an alarm clock or for watching movies, for example. The patents also demonstrate that when the phone is folded, you'll be able to input a gesture on one side of the screen and the corresponding action will take place on the other side. For example, you could make a scrolling movement with your finger on the rear portion of the display to scroll through content on the front. Apparently, you can also move content from one side of the folded screen to the other. All of these details are taken from the patent – for a 'Deformable electronic device with methods and systems for controlling the deformed user interface' – which was filed with the USPTO and WIPO and published on January 10, 2019, so we have no further information on specs, price or release date (if it ever does get released). But given that we're hearing that the Motorola Razr 2019 is likely to be officially unveiled at MWC 2019 in February, wouldn't this be a particularly sweet "one more thing" at the end of the RAZR launch? And if you want one more thing from this story, try this – Xiaomi has just shown off its own folding smartphone.